An edited version of that article was published in Australia and New Zealand in AudioTechnology Magazine issue 26, June 2003. As a sucker for HiFi technology I bought the first model of CD player (Sony’s CDP101) in 1982 as soon as they were released. The promotion of the format led people to expect that CD’s were almost indestructible and would last a “lifetime”. The lifetime turned out to be about 20 years. For me the first CD fatality due to deterioration was the Dead Kennedys’ “Give Me Convenience Or Give Me Death” – it would get to the second track and then skip all over the place. When I held it up to a light I could see a hole about 2mm in diameter right at the start of that track, so I went out and bought a replacement. Anyone who owns CD's that are around 10 years or older should be starting to get justifiably paranoid about the health and well-being of their collection and should be thinking about doing "failsafe" CDR or cassette copies of precious older CD's - while they can still be copied or even played. ExactAudioCopy is easy to use and incredibly reliable. The program keeps re-sampling at slower and slower speeds until it's got the best quality extraction of audio data - converting the files one by one to wav files stored in your nominated folder. When it's finished the CD it displays a printable list of any suspicious spots still within each track. You can use your own choice of audio editing software to listen to those identified spots and think about doing a manual repair, which I’ve only had to do once. Usually there’s no audible error. I've had a couple of my CD’s (Tom Jones “A Minute Of Your Time”, Peter Gabriel's “Birdy” and Joni Mitchell's “Hissing Of Summer Lawns”) which had big holes in the reflective material - looking much like a galaxy with suns exploding if held against a bright light. When I used the "CD Copy" facility of Nero they would copy only with the same audible errors, but by saving the files through ExactAudioCopy I was able to compile perfect sounding copies. You just make sure that you don’t leave any pause between the tracks when you’re reassembling your CD for burning – ExactAudioCopy extracts the files with precision and your reassembled CD will be a remarkable improvement. Some badly deteriorated CD’s won’t work doing digital “image” copies on your PC’s burner and you may have to do a slightly inferior analogue copy, as if you were using your PC to copy a cassette to CD. A portable CD player with 10 to 40 seconds of “shock protection” back-up memory could let you copy a CD that won’t play in a standard unit. Programs like Nero allow you edit and “normalise” the wave file and place track marks exactly where they should be. It's a slow process but worth the effort for a valuable recording. This isn't a bit of urban myth I'm trying to foist on anyone - from my own experience it is cold hard fact that a significant minority of the older CD's in my collection are deteriorating very rapidly. Not just a few, but well over a hundred - and most of them are not easily replaceable, even if I had the cash. 1. Oxidisation of the reflective material inside the CD. There are several easily found sources on the internet for describing CD-ROM manufacture. Basically a CD-ROM (data or audio) is a 1.2mm disc of polycarbonate pressed with a spiral pattern of pits on one side – which is sprayed with a very thin reflective layer of aluminium, then sealed with a thin layer of lacquer and printed with a decorative or descriptive label. The most obvious immediate problem is the gradual oxidisation of the reflective material that lets the laser read the pits embedded in the CD. This happens most often through the label side where the reflective aluminium is only protected by a relatively thin layer of lacquer. Printing inks used by some pressing plants in the past are said to have reacted with the lacquer, but the problem could be more to do with the individual pressing plant processes, rather than the amount of ink - because I’ve found that my “E’G“ label CD’s are among the worst affected, though they have very little label ink. If you hold a CD in one hand with the reflective surface facing you and shine a torch up close from the label side - you'll notice that a new CD has a perfectly consistent apparent density of the reflective material. Try the same with some of your oldest CD’s (usually those over 10 years) and you may notice what's more or less a star map of pin prick holes - with some holes being quite large by comparison. Each hole is a section of the CD where your player is unable to read the digital information (that is still there etched in the plastic, but with no reflective material to bounce the laser back). CD players try to cover up these errors, but if there are too many of them, or if the holes are large, you will start to hear annoying “blips”. If a hole is large enough the player will also “skip” forward, trying to find the next part of the CD that doesn’t have a big hole in it. Even as far back as 1989 this was known to be a serious issue by archivists who were especially concerned with the longevity of data CD-ROM’s (that article is no longer available online) but the rest of the world has stumbled forward regardless with audio CD’s, because of the fact that most deteriorating audio CD’s still sound relatively fine - until they’re damaged enough to start skip, skip, skipping. The worst thing about vinyl was not the scratchy surface noises, but the big nasty clunking scratches that ruined your chances of becoming one with the music. In the mid 70's I bought a modern marvel of HiFi equipment, the “SAE 5000 impulse noise reduction unit”, which monitored the sound from your record and recognised the distinctive wave shapes of scratches. You could adjust the sensitivity while hearing the isolated scratches on the record and then press the "invert" button and hear the music without those scratches. It did this by stretching whatever sound came just before a scratch for the duration of where the scratch actually was. It was not perfect by any means, but it's the advancement of this same principle that lets CD players make apparently continuous music even though there are many bits of the original information missing (whether that’s due to scratches or to a damaged reflective layer). But as I said above, there’s a distinct limit to how much error correction we can tolerate before it becomes annoying. Mostly though we want our CD’s to play all the way through – without skipping – and we want them to last at least as long as we do. That’s why I’d suggest checking your older CD collection and burning CDR copies of ones you can see are deteriorating. If you don’t have access to a CD burner, then a good cassette copy is a long lasting option Most of my early ‘70’s cassettes still sound just as good as they ever did – and most HiFi component brands still offer at least one good quality cassette deck. (February 2007) How are CD-R discs performing as a reliable long term storage medium? The next question we ask is how long can we expect CDR’s last? - and if you search the internet you’ll get conflicting answers. TDK (Australia) claim on their website that their “audio CDR” media has a life expectancy of over 200 years. Other websites suggest that cheap and nasty CDR’s may only last for a few good years. Recently I tried to play an adhesive labelled CD-R of Christmas music which I had compiled and burned in 1999 and found that it skipped so badly that it was unlistenable. I tried extracting the files using the audio data retrieval freeware ExactAudioCopy and it showed that the data was far too corrupted to bother retrieving. So I've been trying to do backup copies of my more important CD-R's from 1999/2000 - a time when I used several different brands of labels and several different types of CD-R's. I had been using cheap "Mr Platinum" brand discs as well as regular TDK CD-R's and the more expensive TDK "CD-R AUDIO" discs. All of the Mr Platinum discs with adhesive labels are badly deteriorated and even those without labels register minor deterioration. There are fewer faults with the labelled regular TDK's and no faults on those discs which had no adhesive label. I am impressed that the TDK "CD-R AUDIO" discs are in perfect condition (so far) - whether they have adhesive labels or not. TDK claim that these discs have an extra protective layer on the label side - and I must assume that I'm seeing the benefits of this. It's proof that we get what we pay for. I'll only be using TDK CD-R AUDIO discs from now on for storing anything that's important, name brand quality discs for other recordings and I’ll never use labels again. This second major problem is apparently also happening throughout the world, but only in places that are warm and humid – like Brisbane and much of the tropics. Many of my CD’s have noticeable clumps of a white or grey spreading fungus on either or both surfaces. However one disc has a noticeable fungal infection spreading into the reflective layer from the centre as well as from the outer edge. This fungus is apparently related to one that causes throat infections and other problems for humans. The fungus can grow in the area between the lacquer and the polycarbonate, after gaining entry through poorly sealed edges or through holes in the lacquer layer. The fungus actually eats away at the pits in the polycarbonate and allows faster oxidisation of the aluminium – rendering the affected areas unreadable. The researchers say it’s no great surprise that the organic matter of CD’s was eventually found palatable by such an organism. However I don’t think there’s any safe anti-fungal spray for CD’s. Damage by this fungus may be slower than by oxidisation, but it is no less certain to render your CD’s useless in the end. 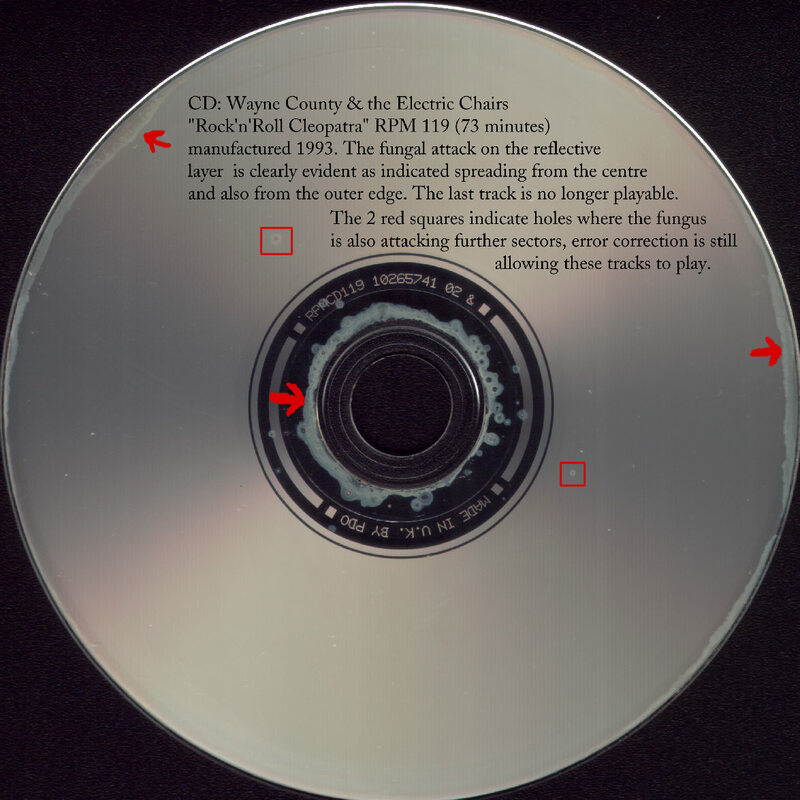 It seems that CDR’s themselves may also be prey for polycarbonate-eating fungi, so the problem of deteriorating compact discs in hot, humid climates may be ongoing. So my advice is to make sure you enjoy your CD collection while it’s here – because in 10 years time it could be just so much polycarbonate, neatly packaged with a nice booklet describing what used to be stored on the CD. Let’s hope the record companies and manufacturers - who have stayed deafeningly quiet about all this – will have learned their lesson and that they are using improved materials for today’s DVD’s and CD’s. Only time will tell. One article I’ve read on prolonging the life of CD-ROM’s suggested dry storage at minus 9 degrees Centigrade – gradually raising the disc to room temperature before use. This may be fine for irreplaceable data CD-ROM’s, but it’s not practical for a domestic music collection. What I’m doing at the moment is finding the CD’s with noticeable deterioration and doing “triage” – burning copies of the worst affected first. Unfortunately the Tom Jones version of “When I Fall In Love” has already been oxidised into oblivion (see 250k image of CD) and Jayne County's "Man Enough To Be A Woman" has fallen victim to a fungus with no respect for cutting edge rock'n'roll (see 250k image of CD). 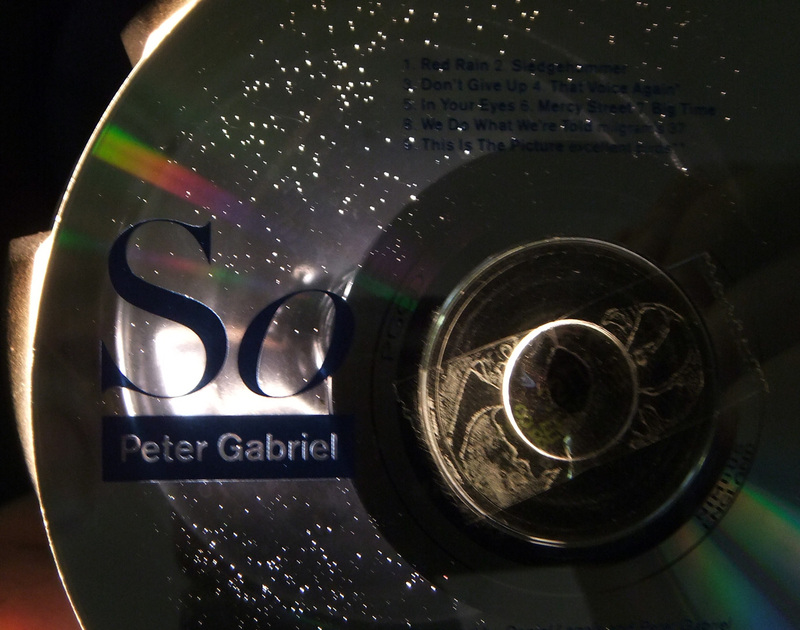 Update October 2016: One of my factory pressed CD’s which is in the worst condition due to oxidisation of the reflective material is the original release of Peter Gabriel’s “So” album – when viewed with a strong light behind the label it looks like the cosmos, and yet (“so” far) it still plays perfectly: view 330k jpg image (note the bit of sticky tape you can see across the centre was to temporarily hold the CD over a large Maglite). All of the information in the rest of the above article still holds true – including that my reputable brand CD-R’s which never had adhesive labels are still playing properly. PS: A newly discovered problem for me is with a few USA factory pressed DVD’s which I have found to no longer be playable due to very obvious “delamination” (the glue binding the layers together has failed) – but this could be the fault of quality control at wherever Capitol in the USA get their Beatles discs pressed. The DVD’s are the “Help!” Special Edition, and all 5 discs of the 2003 “Beatles Anthology” boxed set.